The San Francisco Exploratorium is no ordinary museum. Founded in 1969 by Frank Oppenheimer, a noted physicist who worked on the Manhattan Project under the direction of his brother, J. Robert Oppenheimer, the Exploratorium focuses on science, art and human perception while serving as an incubator for ongoing student experiments. 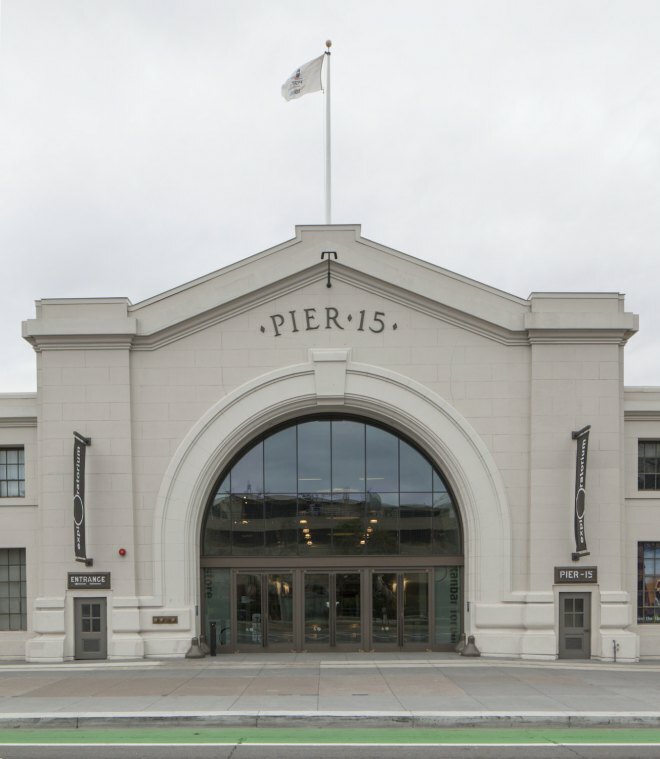 When this institution decided to establish a new home on the San Francisco waterfront at the famed Pier 15, there was no doubting its commitment to the 21st century’s conceptions of the science and art of buildings themselves. Pier 15, more than 80 years old, had recently undergone rehabilitation both historical and sustainable, so the Exploratorium endeavored to create a model of sustainability for museums. The result is a spectacular structure that speaks volumes for art, science and human perception, comprising 330,000 square feet of indoor and outdoor space and hundreds of interactive exhibits. 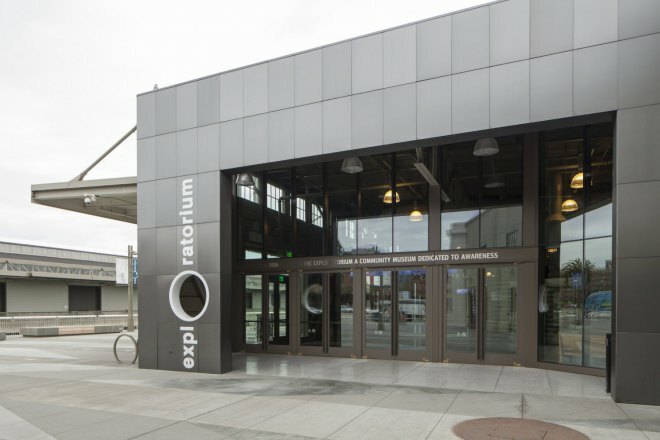 The Exploratorium achieved LEED® Platinum certification and is pursuing the designation of the largest net-zero energy museum in the United States. And what is the first element one encounters when visiting the Exploratorium? One of 14 custom balanced doors from Ellison Bronze, through which more than 550,000 visitors pass each year. 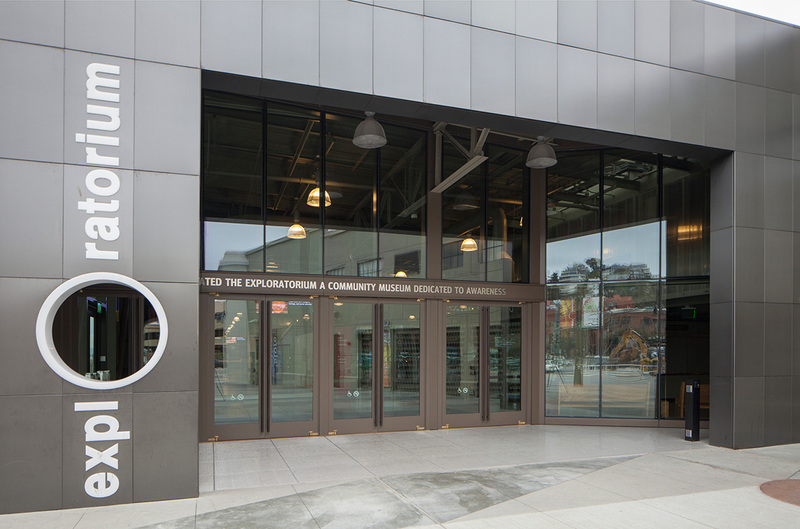 The Ellison balanced doors are located at the lobby and museum entrances of the building. 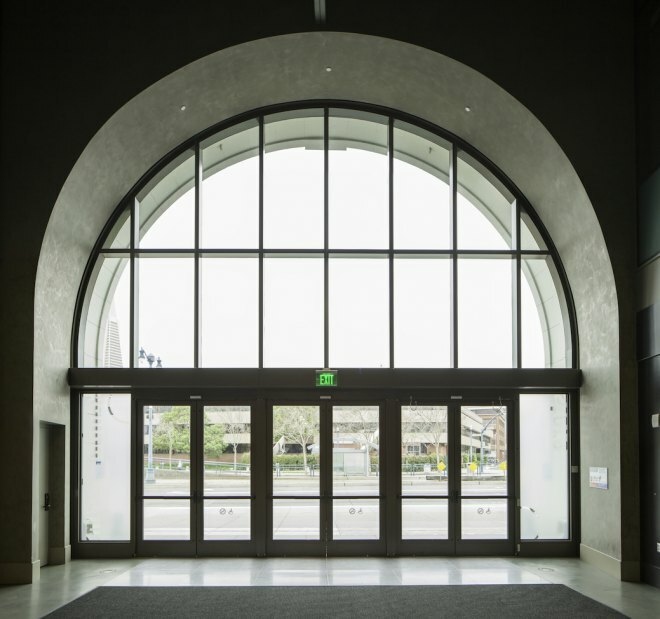 Three pairs of Ellison doors are situated at the lobby entrance, part of a two-story restored façade clad in stucco. The separate museum entrance contains four pairs of Ellison doors, coordinating with the paneled façade. 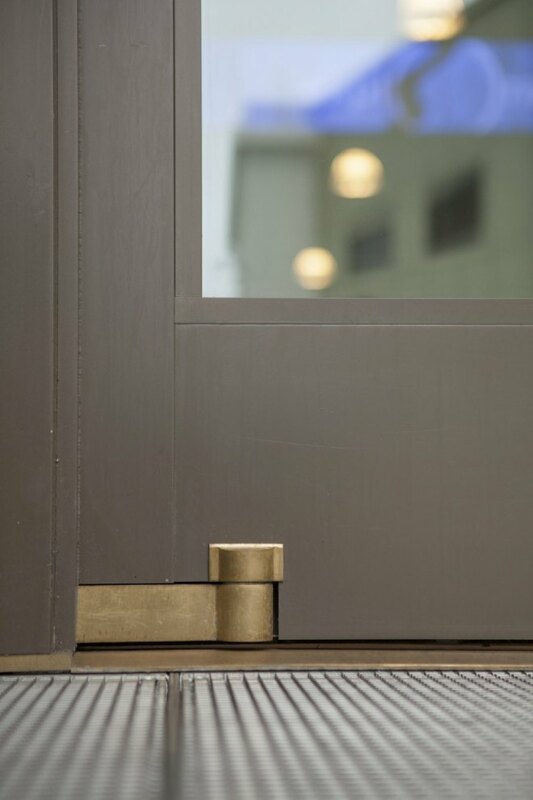 As with countless other prestigious projects in its 100+ year history, Ellison Bronze, based in Falconer, NY, created doors that achieve the highest standards for both aesthetics and functionality. 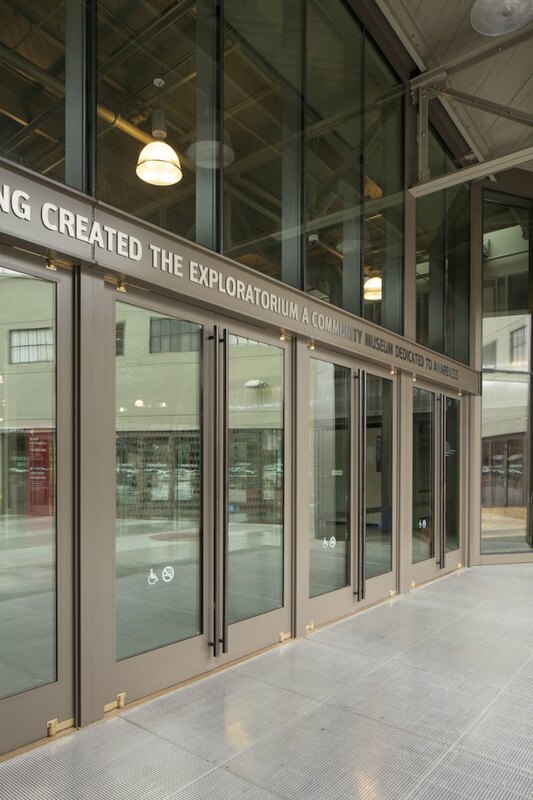 The custom balanced doors at the Exploratorium feature stile and rail type construction of extruded aluminum material with an “Enduring Bronze” painted finish. Several door units include Ellison PowerNow power operation functionality, providing optimal access for all users. Unlike conventional entry doors, an Ellison aluminum door is constructed from heavy wall extrusions that are made solely for Ellison and specifically designed to work in conjunction with their balanced hardware system. The door leaf’s horizontal top and bottom rails are attached to the vertical stiles using both welded and bolted connections, yielding an extremely durable and long lasting entrance. 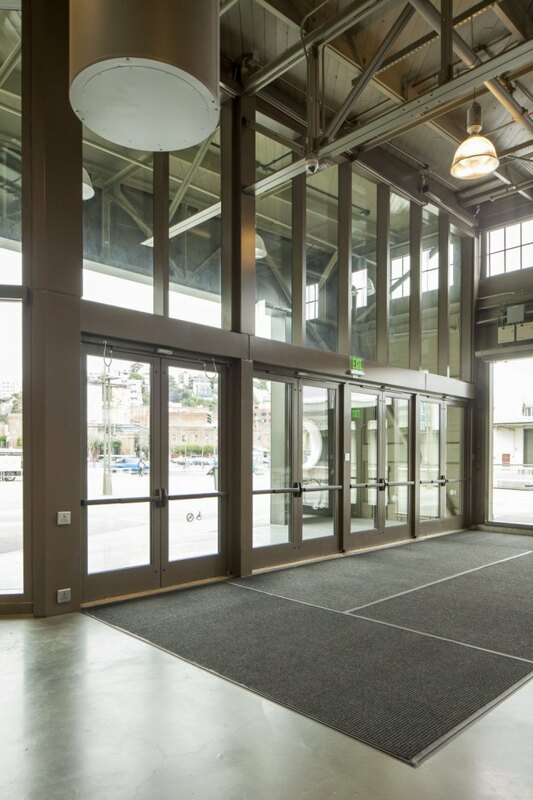 While Ellison balanced doors consist of heavy and robust components, they can still be opened with ease. 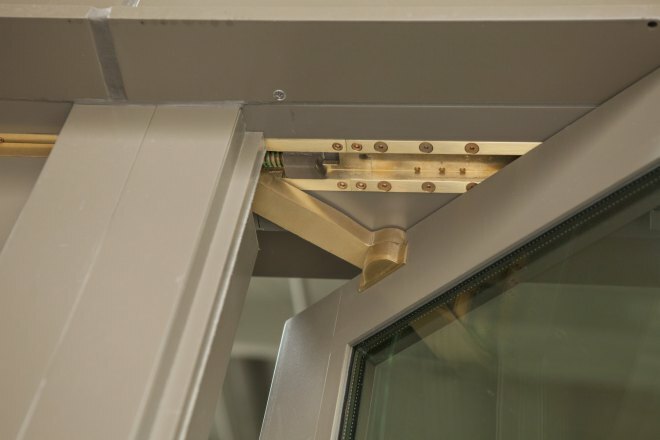 A balanced door features an inset pivot point at two-thirds the width of the door, creating a balance that distributes the weight so the door requires little force to open. The inset balancing point allows for an easier open force, even against external wind and internal building stack pressure. Ellison provides detailed record keeping and full warranties – important when considering the extensive lifespan of an Ellison door. Every door made is imprinted with an individual project number (similar to that of a car’s VIN number) to facilitate easy tracking and maintenance. Furthermore, all Ellison balanced hardware components are machined in-house, which means that replacement components are always readily available. This commitment is invaluable to the Exploratorium at Pier 15, a facility that expects a long lifespan, and future expansion to neighboring Pier 17. 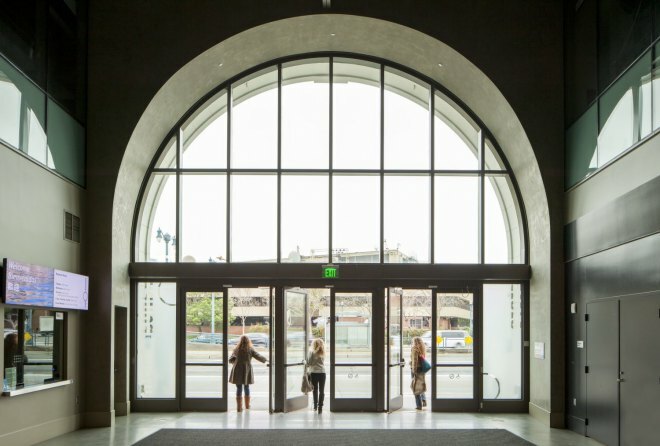 The Exploratorium’s new home at Pier 15 is three times as large as its original location at the Palace of Fine Arts. The museum’s design incorporates a bay water heating and cooling system, rooftop photovoltaic arrays, rainwater collection – and high-performance windows and glass. 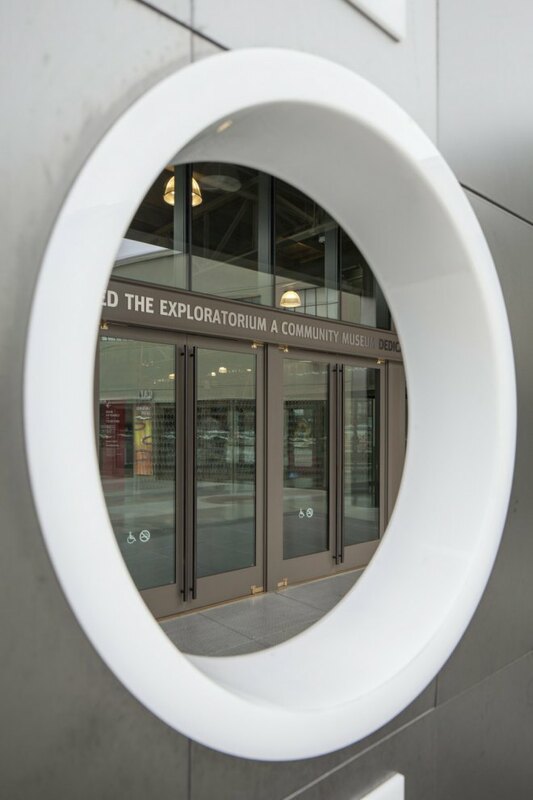 The Exploratorium reopened at its new home in April 2013. The project team included architect EHDD, San Francisco, a past recipient of the AIA (American Institute of Architects) National Firm of the Year award; glazing contractor Architectural Glass & Aluminum, Livermore, CA; and Ellison representative Apollo Architectural, Penngrove, CA.